If you should ever find yourself visiting Brooklyn, do yourselves a favor and walk — down boutique and café-lined avenues, tree-shaded streets and, by all means, across one of New York City’s most beloved landmarks, the Brooklyn Bridge. The bridge, which links the boroughs of Manhattan and Brooklyn for walkers, bikers and drivers, was, at its opening in 1883, the world’s longest suspension bridge. Its location provides visitors with spectacular views of the NY skyline. 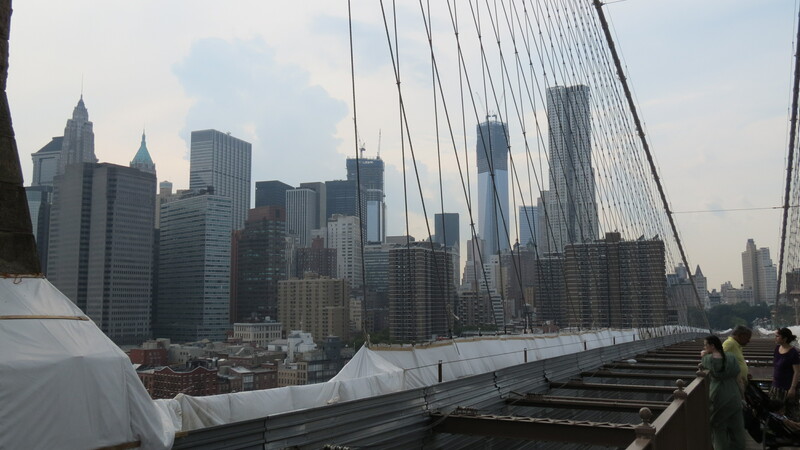 Looking from the bridge toward downtown Manhattan. The buildings under construction (just behind the cables) are part of the World Trade Center site. The one on the right (with two cranes on top in a V-shape) is the Freedom Tower. While there are many people who jog and bike across the bridge, I prefer a slow stroll along the pedestrian promenade. Visitors insist on leaving their mark. Rather than vandalizing the bridge, they now lock their messages to the bridge. International visitors also join in. 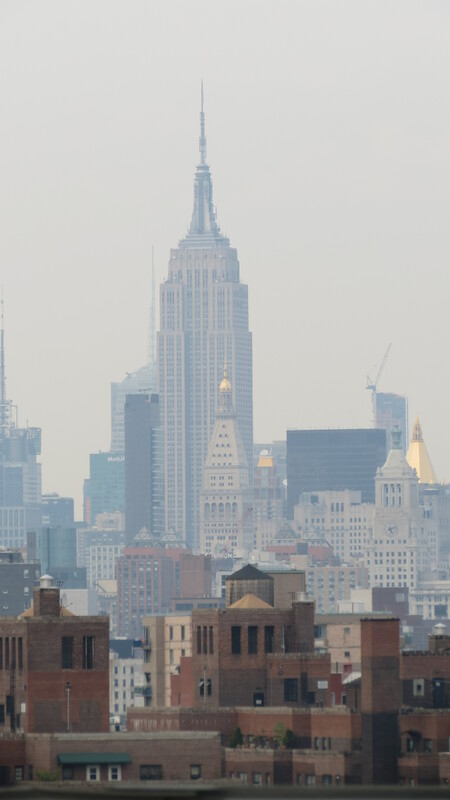 As you face Manhattan and look right, you can get a view of the Empire State Building. 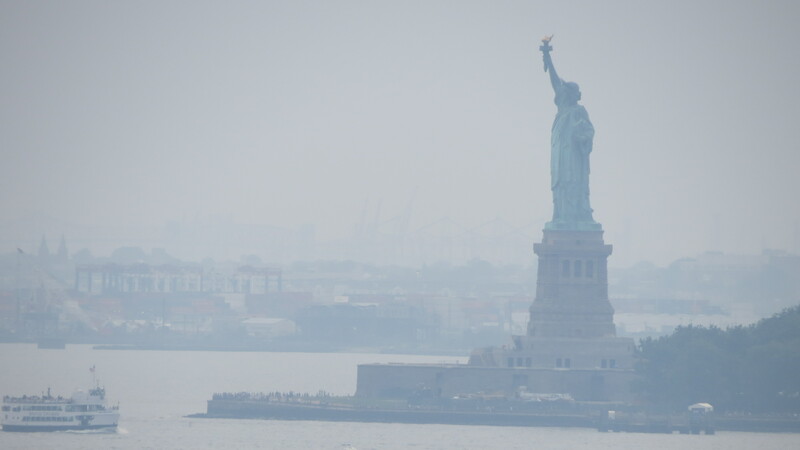 Look left, and it’s the Statue of Liberty. Arriving on the Brooklyn side of the bridge, you will be in Brooklyn Heights. Here is a chance to wander off the main thoroughfare and get lost among the smaller streets and their dazzling show of window boxes. When it comes to planting in pots or window boxes, I tend to keep the same plant in its own pot – and then group the various pots. I never mix and match in the same pot – more out of a lack of confidence and fear that I will end up with a mismatched jungle. 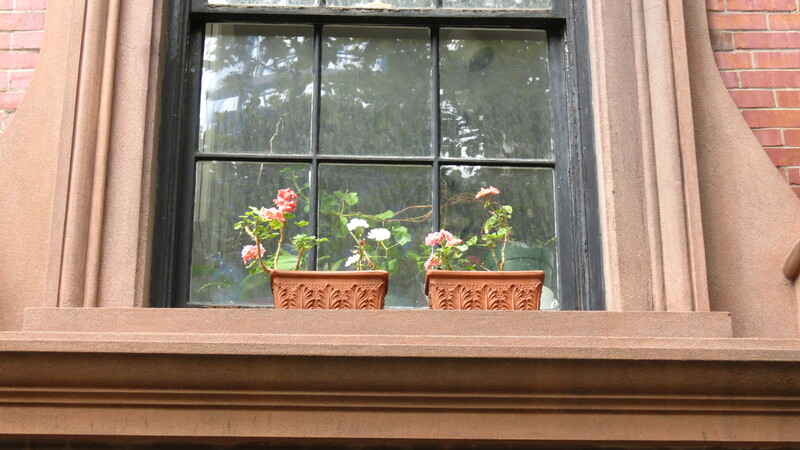 Yes, window box planting is a skill of which I am truly in awe, and I am completely surprised by the variety that these Brooklynites have on display. And an “A” for effort. And an entrance that takes my breath away. Clearly, all of this walking burns a lot of calories — but this is Brooklyn, one of the best boroughs in which to replenish those calories. Although I didn’t take photos of our food, here is what and where Joe and I ate. Lunch: Totonno’s in Coney Island for some thin-crusted pizza. It’s a small place and certainly not fancy — but it is one of the pizza parlors that is always touted as the best among pizza afficionados. You cannot order by the slice, so Joe and I ate a small pie — that’s four slices each and that kept us quite full. Dinner: Still full from lunch, we opted for a small bite at Dellarocco’s in Brooklyn Heights. An order of meatballs was perfect — but the tables around us were overflowing with pizzas and calzones. Delicious! Dessert: Yes, there is always room for dessert — so we returned to Joe’s childhood neighborhood for some spumoni, which is an Italian ice cream, at L&B Spumoni Gardens. YUM! Yes, this was definitely a day worthy of an all-capital YUM. Thanks very much for the tour, I loved it! 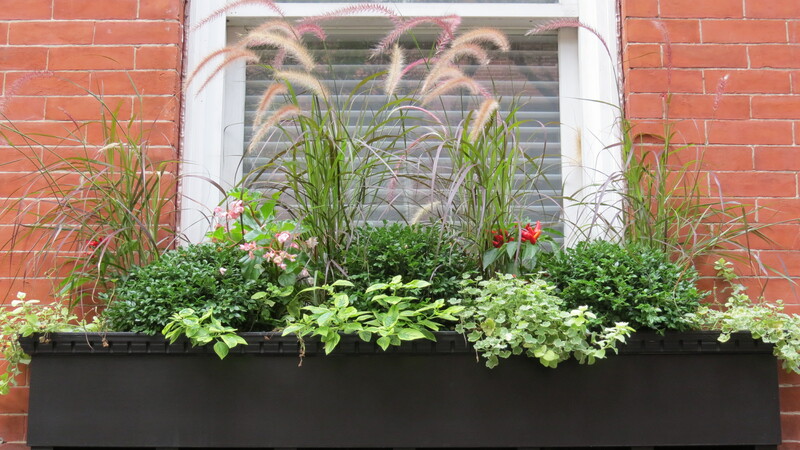 Great tour…especially enjoyed the window boxes. The tropical one would be my fave. 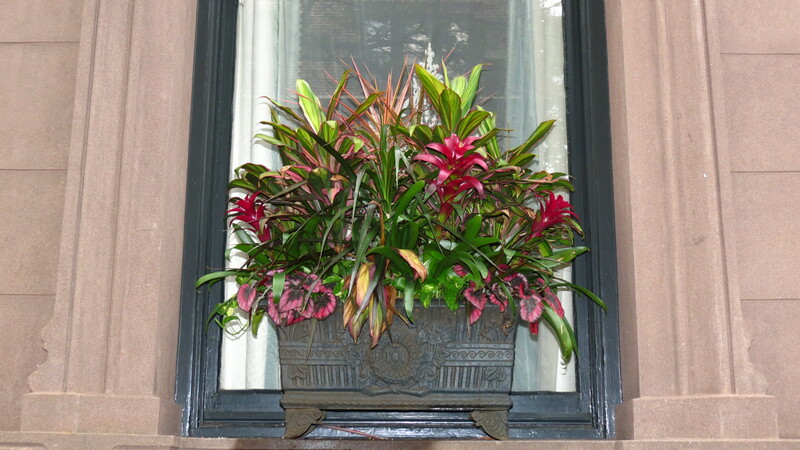 I was surprised to see that in a window box — and most of them were quite impressive. 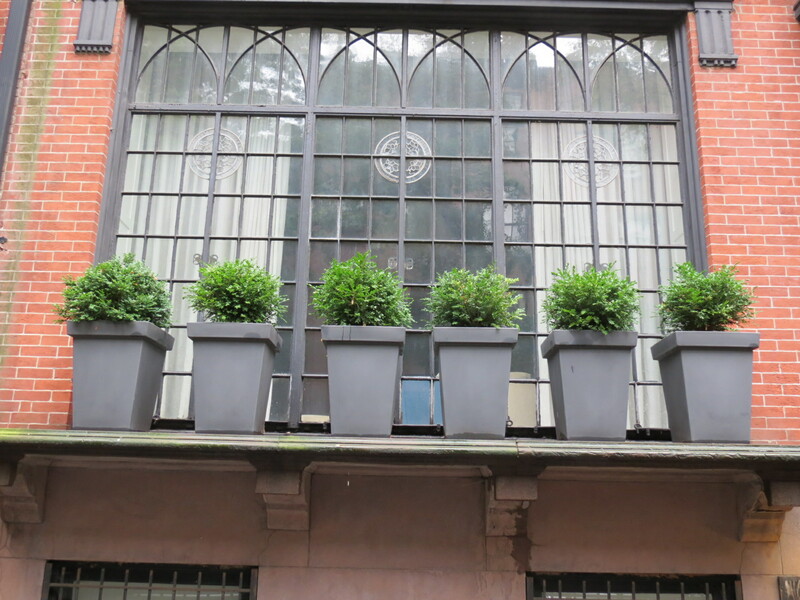 I also liked the row of boxwood. Very cool ideas that can work in most places. Hope all is well. As someone who grew up in New York and now lives in the Midwest, I really enjoyed this post. It brought back memories of foods that are hard or impossible to find where I live now. Buckets of steamer clams … calzone … knishes … and hot dogs with sauerkraut and spicy mustard from street vendors. The bizarre custom here is to pile pickle spears, sliced tomatoes, and all kinds of other things on their hot dogs. Oh, and the skyline and window boxes are very nice, too. Especially the one with the tropicals and the one with the pennisetums. I love it when I get a chance to stroll through, listen to, taste, smell, and see NYC through eyes of wonder. Lovely tour! I’ve always wanted to visit NYC…thank you for the lovely tour! I hope you can make it here. There is so much to see and enjoy. Personally, I like NY in autumn — the air is clear and the humidity is gone. What gorgeous window boxes! I loved them all. My husband and I try to get to NYC every 2 years and always explore a new neighbourhood. Well, it’s gonna be Brooklyn next time for sure! Last time we were there, my husband rented a bike and rode through Manhattan (early in the morning before traffic) and also crossed the Brooklyn Bridge. Me, with my bum knee, have only seen it from the other side. Anyway thx for the great suggestions. Glad you took these terrific photos! Hi Astrid. By all means, add Brooklyn to your trip. There is a lot to see and so much to absorb. Hi Beth. The locks were a surprise — and actually very touching. It seems that people throughout the ages just like to leave their mark. 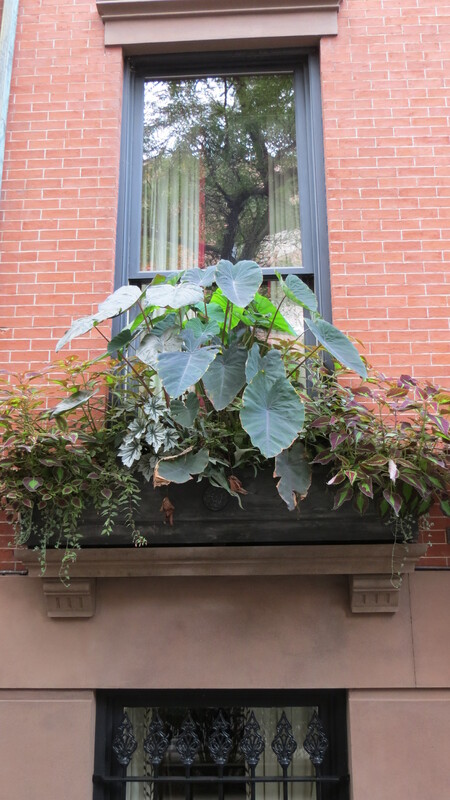 As for the window boxes, they were inspiring — and I may face my fear next season. Hope you’re feeling better. Yum. All that Italian food sounds delicious! 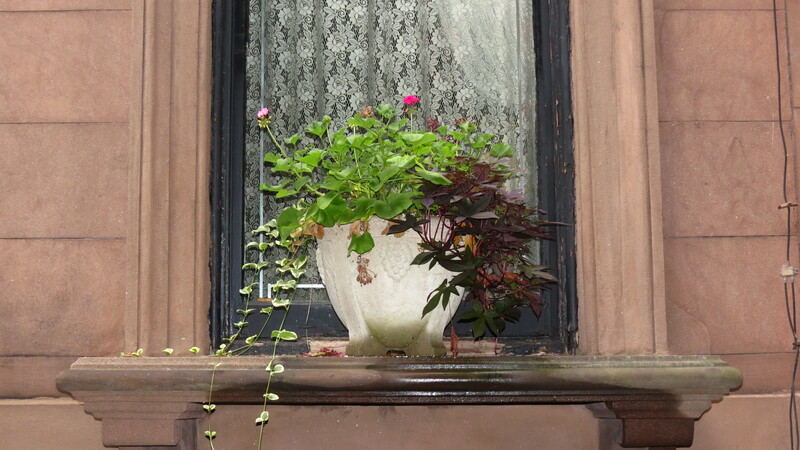 And I love all the different window box displays. 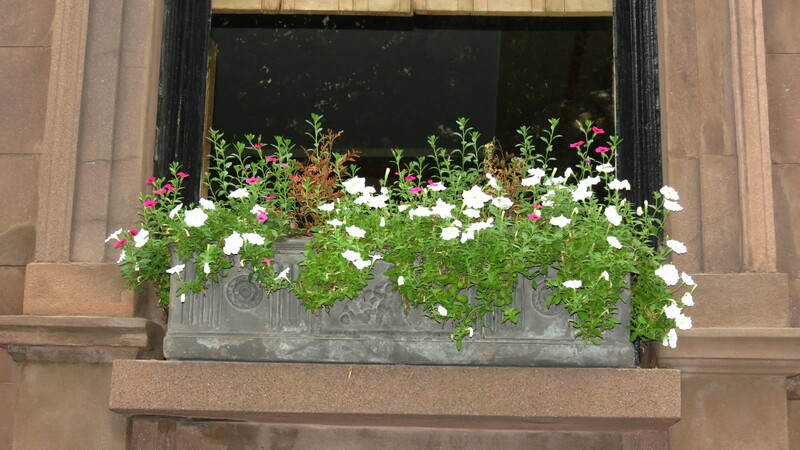 I have always loved the look of window boxes, but I have a very hard time remembering to water my container plants (I’ve already killed all the plants I had in containers this year). Still, I love to look! I also found the locks so interesting! What a fun idea. I bet it was a hoot looking at all the messages on them! The food was delicious! And the locks were a great surprise. I was pleased to see that people did not scrawl their messages on the bridge itself. The locks seems like a fair compromise. Lovely post. 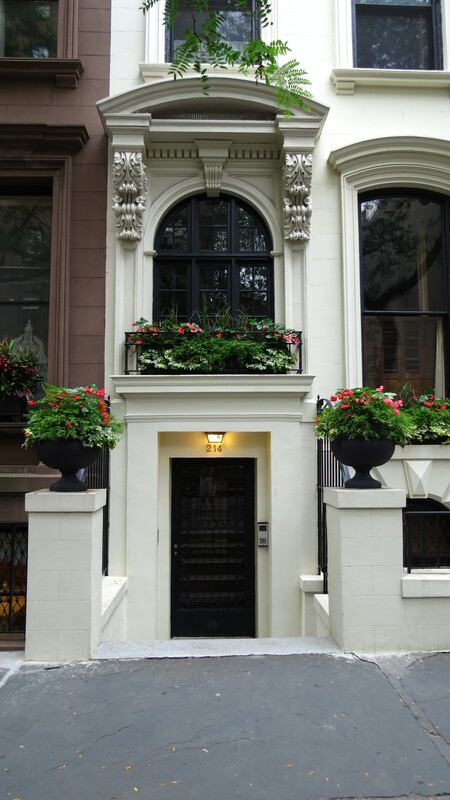 It brings back memories as I lived in Brooklyn Heights in the ’90s. Glad to see the window boxes are as great as ever. Really loved the Promenade. Nice job capturing the charm of the area, Kevin. You remind me that, with a relative living right near the promenade, I need to drop in on her. Love the view of Manhattan and the bridge from there. Lee, that’s a million dollar view. Hope you can make it down for a visit. Thanks for the tour! I enjoyed seeing the window boxes. This just proves that even in the most urban environment people have an urge for green growing things and are uplifted by natural beauty. The earth is in us all! What a wonderful tour Kevin. I like the locks on the bridge rather than the graffiti too. What fantastic windowbox plantings. I never thought about it but it is a great way to grow and have some flowers in the big city. The one with the Elephant Ears is amazing. NY has such an iconic skyline, thank you! And I’m with you on windo wboaxes as well, I lack the confidence too, but you know what if I don’t try I won’t learn. Inspired, thank you ! I’m with you on that one, Claire. It’s time to roll up my sleeves and give it a go. 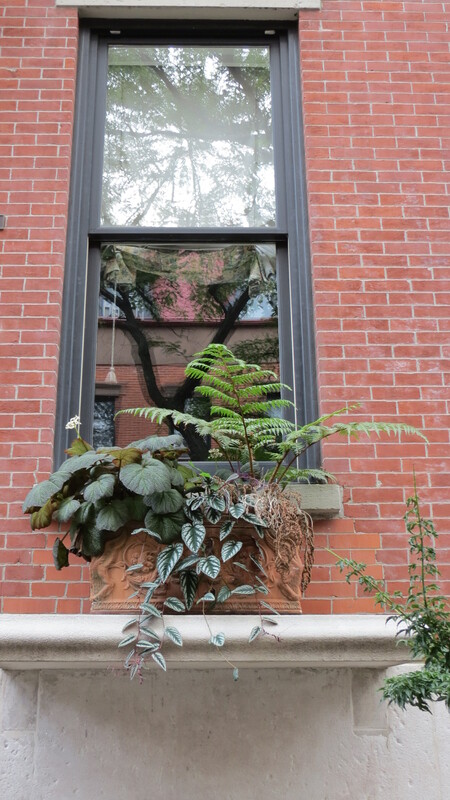 I love the photographs of all of the varied window boxes. It was neat to see an element of New York that is not from the ‘touristy’ perspective! Hello. Glad you enjoyed the tour. Actually, when I travel anywhere, I like to go where the locals go. Thanks for the comment! I am enjoying your posts and this was a visual delight of my city! thanks, Kevin. Hi Cathyann. Glad to accompany you on a walk down memory lane. Hope all is well.